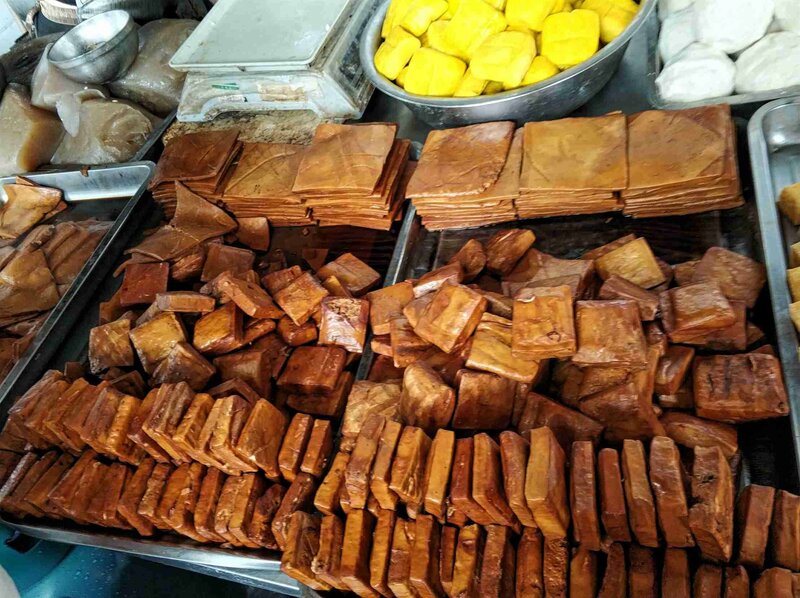 Smoked tofu 豆腐干 or 香干 is one of those things that I would have given you a funny look about only a few short years ago. Today I can't get enough. It has its own distinctive flavor but also plays well with others. 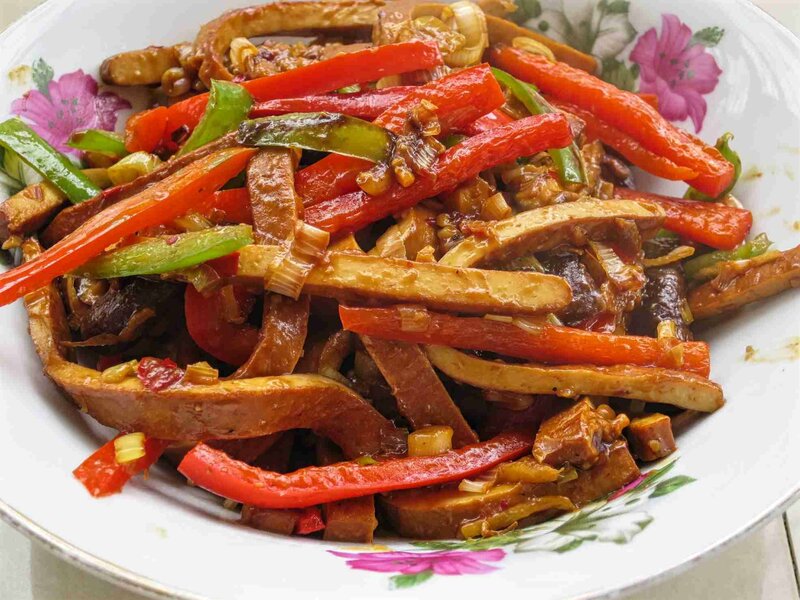 One traditional popular taste combination results from pairing it with slightly spicy tapered green peppers 青椒 or 青尖椒。This is one of those dishes that you can confidently order in any real Chinese kitchen from a simple hole in the wall to a prestigious place sporting a Michelin star. Let me show you how it worked out today, partly as a way to introduce you to yet another kind of tofu. It most often comes in rectangles about 4 by 6 inches and a bit less than half an inch thick. As you can see from these pics however, that is not a hard and fast rule. The ones I bought yesterday cost less than one Yuan each. 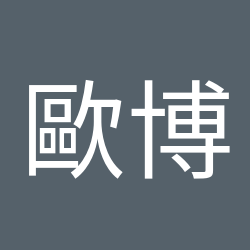 At home I cut mine into thin strips 条。Sometimes I cut them into postage-stamp squares or cubes 丁 instead. 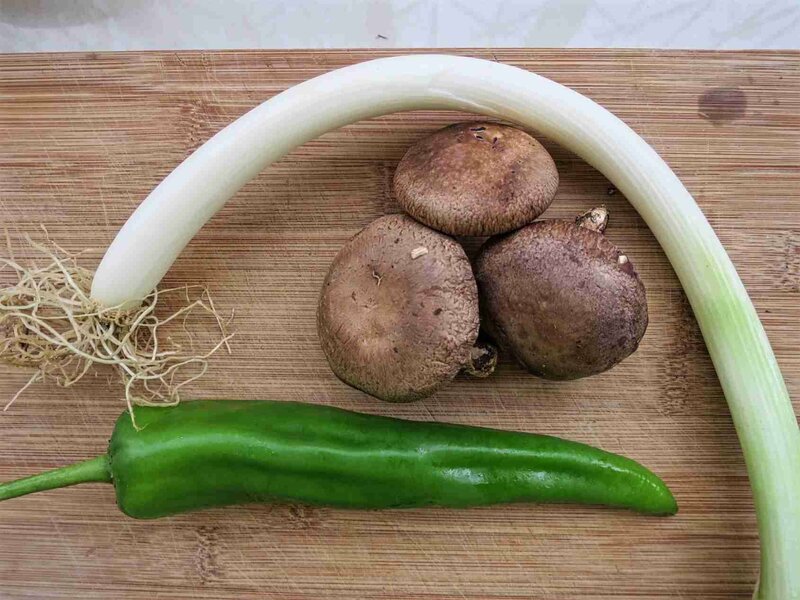 Here's the green pepper 青椒, a large spring onion 大葱, and a few mushrooms 香菇。Later I added a red bell pepper 红椒 for enhanced eye appeal. Chopped a couple cloves of garlic 大蒜 and ginger 老姜。These green peppers have very little bite, but if you must have really bland food, substitute a green bell pepper. Got out a jar of Grandma's douchi 老干妈豆豉, a type of spicy fermented soybeans popular here, originally from Sichuan. Sometimes I supplement this with 豆瓣酱, but today I didn't have any on hand. Scooped out one heaping tablespoon of it into a small dish. That's how much I will use, and I wanted to show you what it looks like. Add a tablespoon or two of corn oil 食用油 to a flat-bottom skillet or a wok (both work well for this) and fry the aromatics over medium heat until they begin releasing their aroma 炒出香味。The aromatics here mean the onion, ginger and garlic. 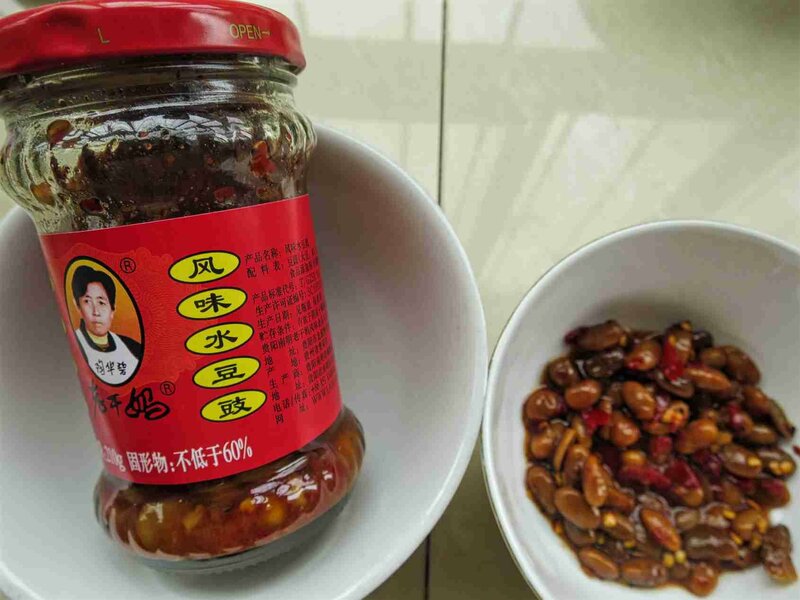 These are such a classic combination that in "recipe shorthand" they are written as one word without punctuation: 葱姜蒜。Then add the spicy fermented bean sauce 豆豉 and crush most of the whole beans with the back of a spoon. 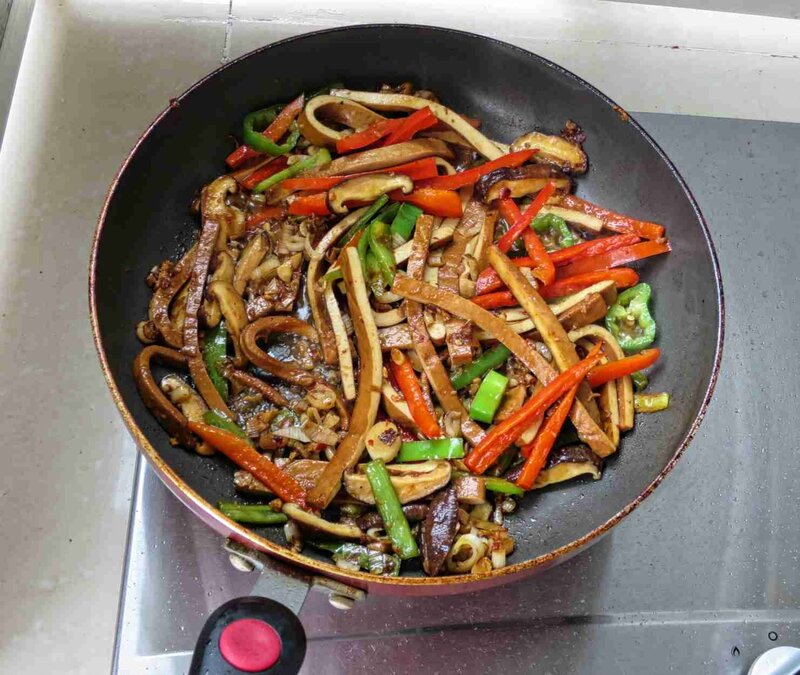 Add the smoked tofu strips 香干丝 and stir fry using flipping motions 翻炒 with your spatula tool 锅铲 for a minute or two, until everything begins to soften a little. 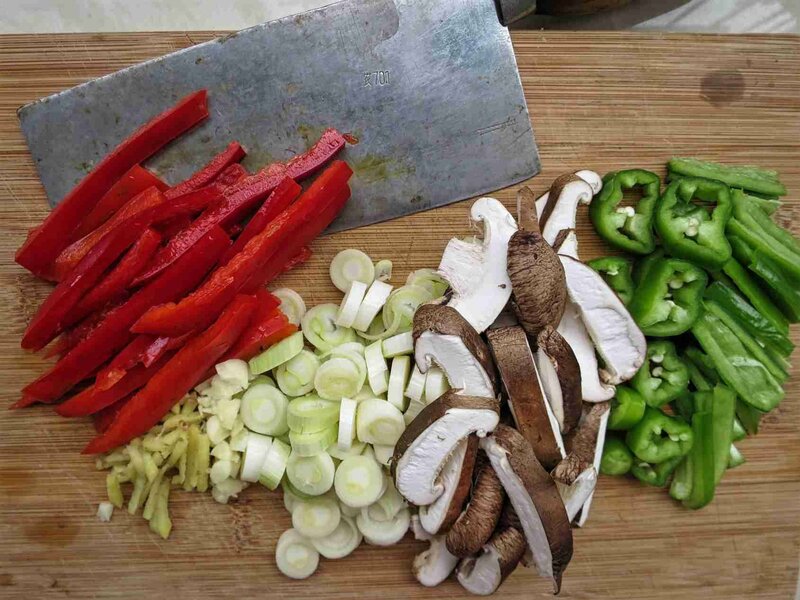 The red pepper goes in last because it takes the least time to cook. It's OK to add a little water if needed to prevent things from burning. 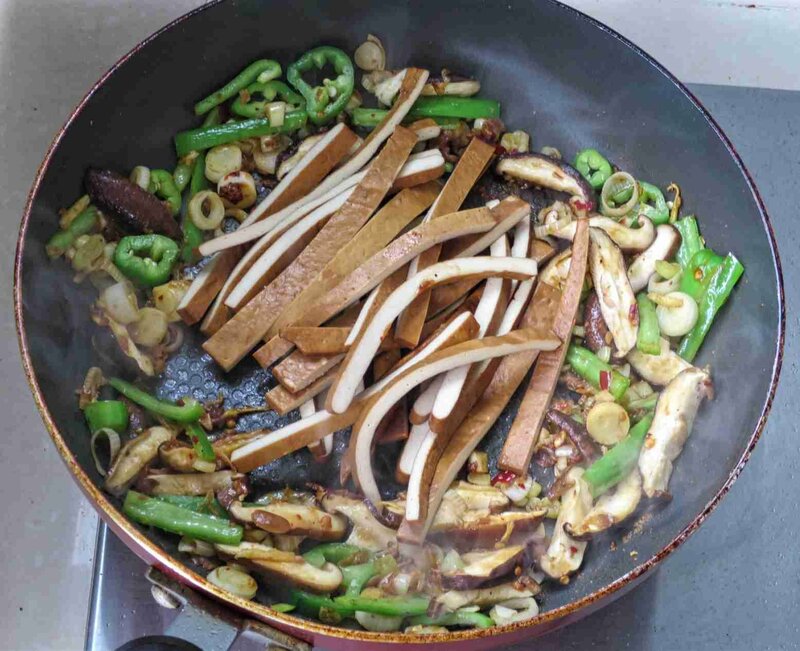 Some dishes need to be made dry 干煸, but this isn't one of them. Now sprinkle in a half teaspoon of salt 食用盐 and a quarter teaspoon of chicken essence 鸡精。Add about a tablespoon of light soy sauce 生抽 and thicken the dish 收紧 with a small splash of corn starch slurry 水淀粉。Presto, you're done. Total time on the flame well under 5 minutes. 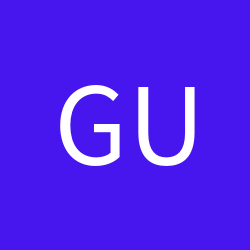 Plate it up 装盘。Good eats! I've read that it's not difficult to smoke tofu in your back yard over coals, but haven't tried it. Obviously this dish goes well with steamed rice; after all, what doesn't? Easy to make, inexpensive, and tasty. 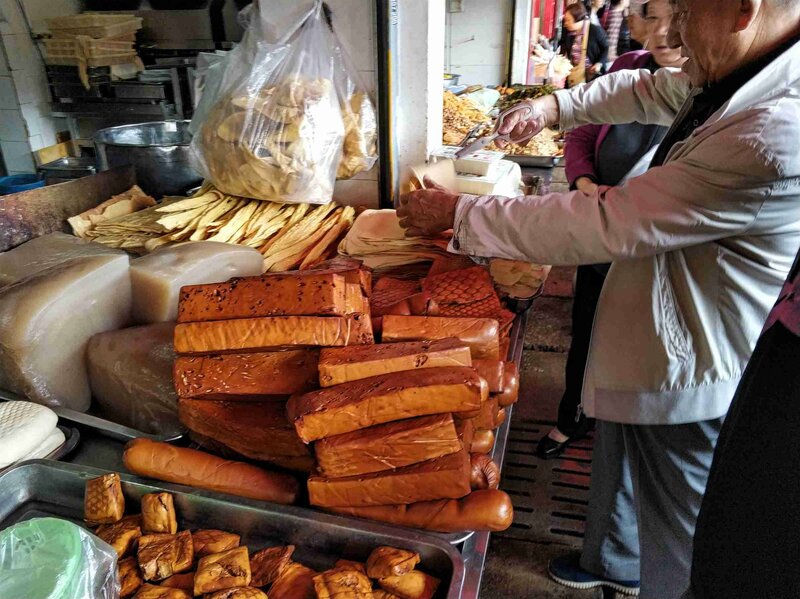 If you live in China I would respectfully suggest that this needs to be part of your week-night arsenal to keep from relying too much on delivered take-out. If you live in the West, it will add some variety to your usual fare without taking much time or busting the budget. Now excuse me while I go find some 青椒豆腐干! Happy hunting @歐博思! Let us know how it works out. Is the smoky flavour created by wood smoke or something else, over just coals wouldn't be the best flavour would it? We have a coal fire and I can't imagine anything tasting nice cooked over it. Has it got a meaty flavour or umami type taste? Is the texture like meat or more like a mushroom or something completely different? Sorry for all the questions but these are the sort of things i wonder about. Thanks for your questions, @Shelley. 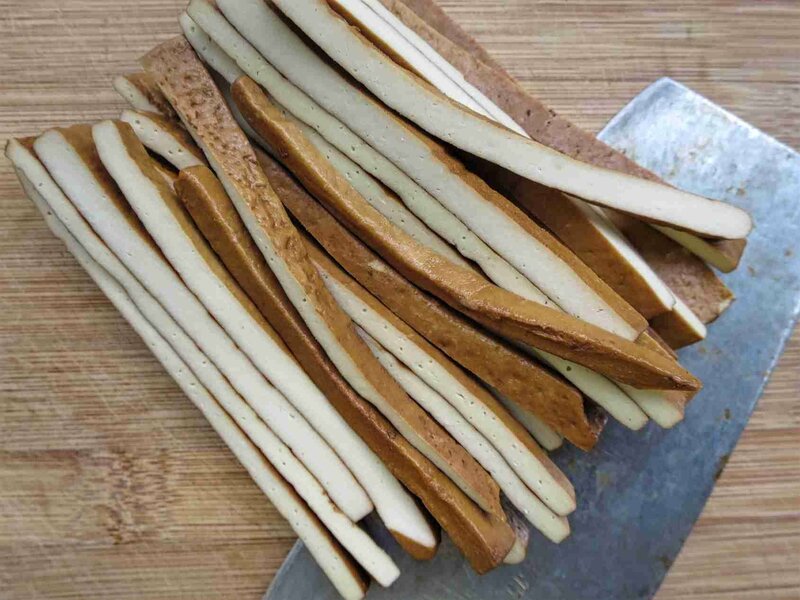 It's traditionally made in a manner similar to a good smoked Provolone or a smoked Gouda cheese. Several hours at a low temperature using some combination of small wood, twigs and chips. It is often smoked in a closed chamber to prevent it from drying out. The flavor can differ from one maker to another, depending a good deal on what kind of tofu he began with. It doesn't taste like meat, but does have a smoky, umami note. Texture also varies according to the formula used, how it was brined, how long it has been pressed and so on; more tender than cured ham for example. It's easy to tear off a bite-sized piece using chopsticks. Knife and fork are not required. 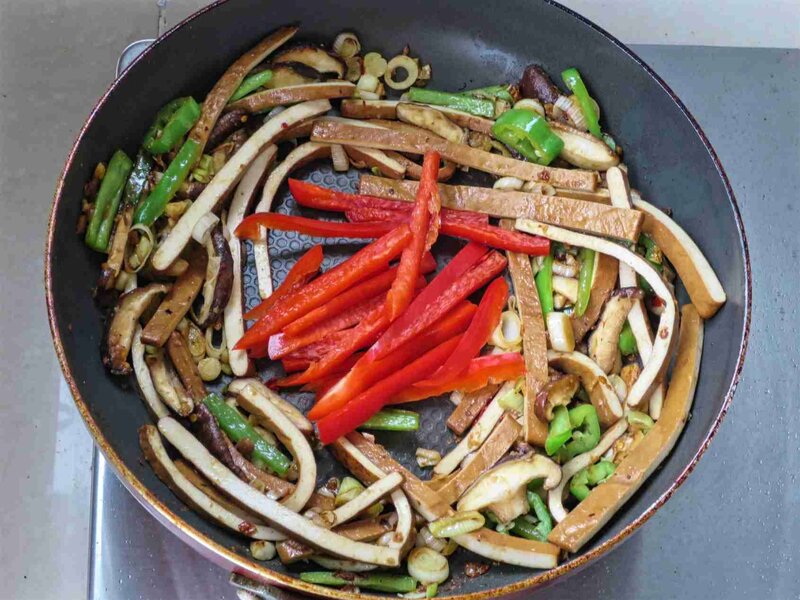 Chinese cooking not only uses tofu to sometimes replace meat, but recipes often combine it with meat for a very full, rounded flavor. 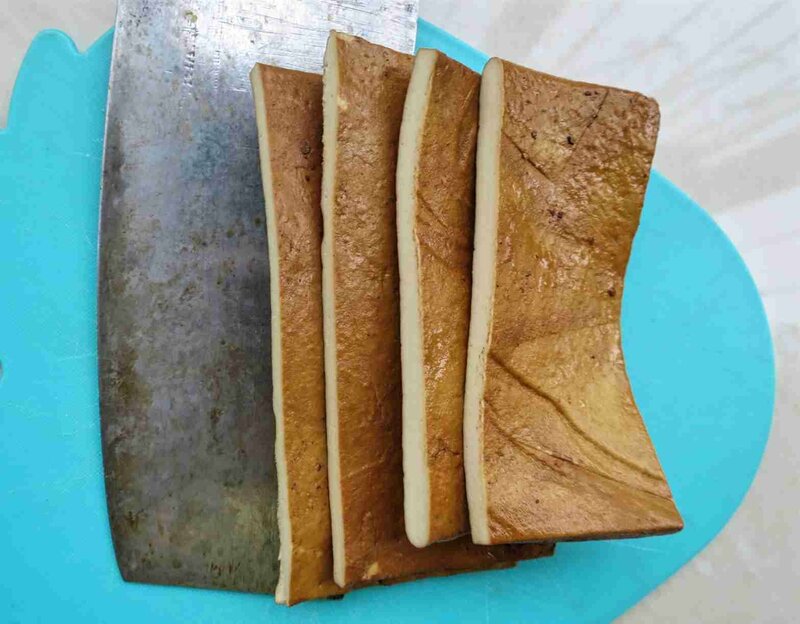 This 豆腐干 is hearty and robust, not weak. pale or namby pamby. I tend to return to the same one or two makers time after time since I have known their products by now over a period of years and just buying it blind one isn't always sure what one is getting. Lord only knows what kind of shortcuts some manufacturers use. I realize that isn't terribly reassuring, but that's the way lots of ingredients are over here. This is a favorite of mine. I love smoked tofu and try to always keep a chunk of it in the fridge for quick lunches or to beef up a vegetable dish with a little protein. I've never seen this color 豆豉！ It's usually black here. Is the flavor similar? I usually buy it in the market, where it's black, as you say. In the grocery store, however, they had two kinds. This light one in addition to the more standard dark variety. Both have similar flavor. I bought this light kind for a specif use, and had some left over. To make a salad with the leafy vegetable that produces the peppery and fish flavored roots known here as 折耳根。I had some in a restaurant and liked it; quizzed my friends about how to make it at home.